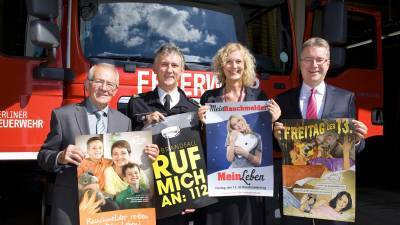 This has been a banner year for Rauchmelder retten Leben (Smoke Detectors Save Lives), which seeks to bring the importance of smoke detector installation into public view. Not only have we hit the 16 year mark of eobiont's work on this important national campaign (we officially celebrated the 15th anniversary in 2015), we have also reached an amazing turning point. This summer, Berlin and Brandenburg—the last holdouts—amended their building regulations for new and renovated buildings, making the life-saving devices a requirement in German homes nationwide! Since 2000, eobiont has been championing this cause with considerable support and hard work from volunteer and professional firefighters and chimney sweeps from around the country. It has been a long but rewarding journey of campaign concepts, online platforms, videos and more, and we couldn’t be more thrilled with the results. Now that such a level of awareness has been reached, the campaign will look towards strengthening services for renters, homeowners and consultants. This will include creating fast access to user-friendly information through a website relaunch and a new social media campaign. We will also simultaneously focus on rebranding the Rauchmelder retten Leben brand.